Mission Hills Hainan "Fantasy Course"
Mission Hills Group – China’s leading golf brand and the country’s largest developer and owner of golf course resort and residential properties – recently announced it will start construction this summer on a “fantasy golf course” at the company’s Hainan Island resort. It will be the golf empire’s 23rd multi-million facility overall in China. 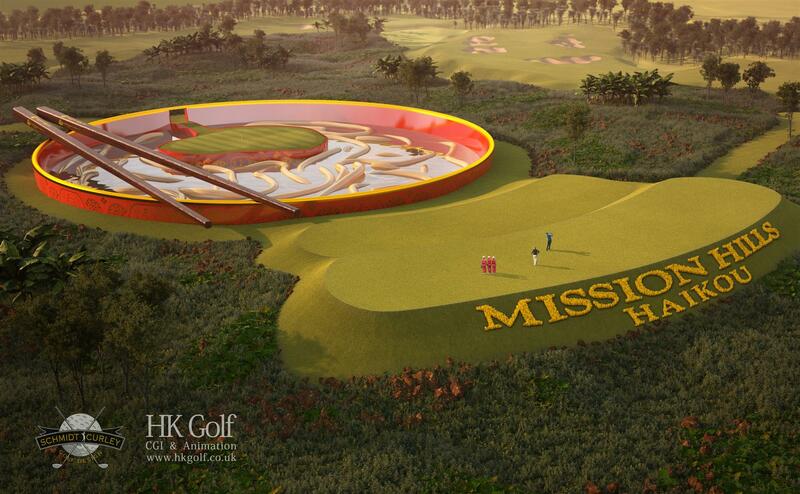 Acclaimed American golf course architecture firm Schmidt-Curley Design will be responsible for creating the newest full-scale, mini-golf experience at family-friendly Mission Hills Hainan. A 2014 opening is anticipated. Previously, the Schmidt-Curley team designed 10 of Mission Hill’s 12 courses at famous Mission Hills Shenzhen – the “World’s Largest Golf Club” – and all 10 existing courses at Mission Hills’ Hainan Island mixed-used master-planned resort development. The newest golf course at Mission Hill Hainan Island, however, is a refreshing whimsical twist on traditional golf course development. For example, the new “Fantasy Course” will include a 400-yard tee-to-green reproduction of the Great Wall, a par-3 hole that plays over a depression filled with replica terra cotta warriors and an island-green par-3 hole where the “lake” is an 80-meter-wide noodle bowl with 75-meter-long chopsticks. Other “Fantasy Golf” highlights are: Tee shot from a grotto through a waterfall on a jungle-themed hole; par-3 where large fans buffet players with strong winds; par-5 weaving through towering Mayan ruins and volcano-themed par-3 with a very difficult shot to a tiny green surrounded by lava rock, or playing into a raised volcano mound much closer to the tee where a pipe sends the ball to the green. Three holes (“Great Wall,” “Noodle Bowl,” and “Riches to Ruins”) are the handiwork of winners from a worldwide fantasy design contest held last year. “As the leader of China’s golf boom and developer of 22 world-class courses, our properties have staged some of the biggest global events and hosted the game’s best players,” says Dr. Ken Chu, Chairman and CEO of Mission Hills Group. “The fantasy course will be a fun alternative for families, novices, and children on holiday in sunny, warm Haikou. Mission Hills Hainan lies in the volcanic region of exotic Hainan Island, China. The resort sets a new standard in leisure, recreation and wellness experiences. Nestled amid lush, green gardens, it caters to golf enthusiasts and features 10 acclaimed golf courses, 518 elegantly designed guest rooms and suites, a three-story clubhouse, China’s first Hank Haney Golf Academy, meeting facilities, 12 world-class restaurants, a fully-equipped sports and recreation center, Hainan’s only aquatic theme park, therapeutic volcanic mineral springs, a spa oasis, and shopping arcade. As one of 10 layouts at the new Mission Hills Hainan – including the critically-acclaimed Lava Fields and Blackstone – the fantasy course presents yet another enticing option for resort visitors. Corporate sponsors are already lining up to be associated with this refreshing approach to the sport. “Golf is typically a very conservative, tradition-filled game, yet there are many calls to make it more ‘fun,’” says Dr. Chu, whose Hainan Resort hosted the prestigious 2011 World Cup of Golf tournament. “We are taking this desire for change to the extreme, feeling many golfers will seek out this new adventure and, while here, play our other wonderful courses. 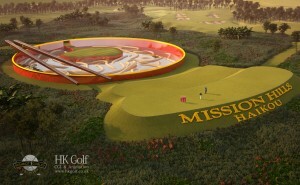 Mission Hills Hainan’s Blackstone Course hosted the 56th World Cup of Golf in November 2011. It will welcome a star-studded, international lineup of sports and entertainment celebrities for the Mission Hills World Celebrity Pro-Am in October 2012. A magnificent addition to Hainan’s tropical island paradise, the resort is poised to become the island’s premier sanctuary, attracting visitors from around the globe. Schmidt-Curley has designed more than 150 layouts in 25 countries. High-profile credits include 10 of the 12 courses at storied Mission Hills Shenzhen – the “World’s Largest Golf Club” – and all 10 at Mission Hills’ new Hainan Island resort. Mission Hills Hainan’s Lava Fields Course is the only Chinese design ranked among Golf World’s “Top 100,” and was named GOLF’s “Best New International Course” of 2011. The resort’s Blackstone Course was named 2010’s “Best New” Asia course by GOLF.